Mud tank is an open-top container, typically made of square steel tube and steel plate, to store drilling fluid on a drilling rig. What is made of mud tank? Mud tanks are divided into square tanks and cone-shaped tanks according to the shape difference of the tank bottom. The body of the tank is made by welding the steel plate and section, using the smooth cone-shape structure or the corrugated structure. The mud tank surface and passages are made of slip resistant steel plate and expanded steel plate. The mud tanks are made of the side steel pipe, all of the structure can be folded without barrier and pegged reliably. The surface of the tank is equipped with a water pipeline for cleaning the surface and equipment on the tank, it uses soaked zinc processing for the expanded steel plate. The ladder is made of channel steel to take responsibility the body, the foot board is made of expanded steel plate. The two-sided guard rail are installed the safe suspension hook. The mud tank is designed the standard shanty to prevent the sand and the rain. The pipeline is installed in the tank to preserve the warm air heat. A tank is sectioned off into different compartments. A compartment may include a settling tank, sometimes called a sand trap, to allow sand and other solids in the drilling fluid to precipitate before it flows into the next compartment. Other compartments may have agitators on the top, which have long impellers below inserting into the tank and stirring the fluids to prevent its contents from precipitating. And mud gun is often equipped at the corners of the tanks’ top, spraying high-pressed mud to prevent the drilling fluids in the corner of the compartment from precipitating, typically for the square tanks. The tanks are generally open-top and have walkways on top to allow a worker to traverse and inspect the level of fluids in the tanks. The walkways also allow to access to other equipments that are mounted on the top. The mud tank plays a critical role in mechanically removing destructive solids and sediment from costly land and offshore drilling systems. 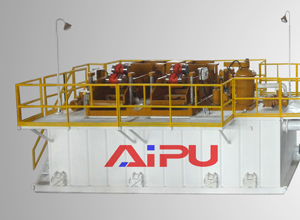 For any questions please come to Aipu solids control.